While visiting Grand Designs Low Impact Living Initiative area at Grand Designs Live last week, my attention was caught by the sparkle of mica in a wall surface on display. As I rocked backwards and forwards with my nose a few inches from the plastered board a kindly Paul Fitzpatrick asked me if I was OK. When I’m not blogging I spend a lot of time immersed in tile grout, adhesive, and plaster so I was trying to work out what it was I was looking at (but without reading the label obviously). Paul explained it was clay plaster and agreed that one of things he likes about the plaster is the interaction with light. He is a man who is really connected with his material, and he has used this ceramic plaster all over his own house in Cornwall. It can be used in modern settings but it really comes into its own where is it is used instead of gypsum products. It is hygroscopic, so it breathes with the house and absorbs or releases moisture depending on the humidity in the room. It is less dust-forming and less prone to condensation (with the resultant molds) than Gypsum, which will absorb moisture quite happily but it will not let it out again. So clay plaster is very well suited to houses for people who suffer with asthma, or who have allergic reactions to more modern materials. Paul explained that the surface helps regulate temperature as well as humidity and it even absorbs smells (and the manufacturers literature claims it also screen electromagnetic radiation, but you will have to do your own research to verify that). 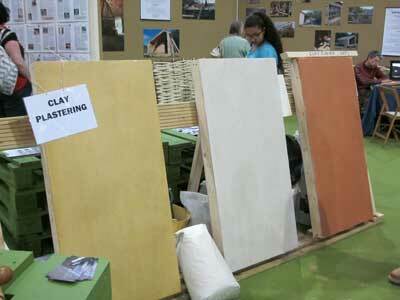 Clay plaster can be applied to cob walls, lime plaster, hemp and straw-bale houses and other breathable wall surfaces. It can also be used to plaster ceilings, and I would think a contrasting colour or finish on wall and ceilings would look really effective where ceilings are high, and a single light colour used on floors and ceilings would really open up a room – especially an attic or cottage with low ceilings. It is a natural product and comes in a base coat and a choice of top coats, which can be supplied in one of a range of premixed colours using natural pigments. The mica I was so admiring is an optional finish in the top coat. Once applied there is no need to paint because of the coloured finish. In this respect it is very like polished plasters such as Venetian plaster, Marmorino and Tadelakt. These are also designed to be left unpainted and will not need decorating for many years. You can read more about these sorts of plasters in our polished plastering project. Clay plaster is applied much like ordinary plaster products – with a metal trowel, but the finish is achieved with a plastic trowel which smooths and seals the surface, or with a damp sponge to leave a slightly textured and open grained surface. I did a bit of research into the product and production company Clayworks, on returning to the office. 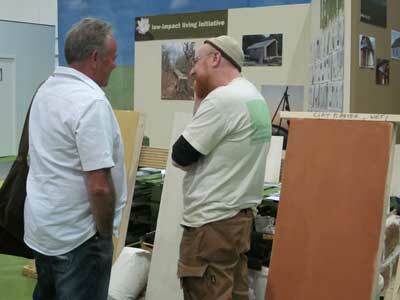 They are a family run business, based in Cornwall and they are dedicated to using natural finishes. They will supply the plaster in 25kg or 1 tonne bags and their products are a mixture of completely natural sands and clays, so the products are 100% biodegradable. Find out more about Clayworks here. Paul Fitzpatrick specialises in traditional building techniques using sustainable materials and you can see more about him on his website. One of my favourite projects is his bus shelter – check it out on the Strawhaus website.